Originally designed as a recreational park, the Perdana Botanical Gardens sit within the 170-acre Tun Abdul Razak Heritage Park in the Padang Merbok — the heart of Kuala Lumpur. Located near Parliament, the National Museum of Malaysia, and the Central Railway Station and about 2km west of Chinatown, the Gardens are a great spot for running. There are beautifully landscaped paths through more than 10 different types of gardens, or ‘collections’. The park also has amenities such as a cafe, water, and restrooms, and has good transport access. Note: from the Pasar Seni metro, there is an underground passage/overhead bridge to the park. For running, we recommend you design your own route, with about 3-4 km of non-overlapping walking trails along and around the gardens. It’s 1.1 km north-south. There are some hills and stairs that will help get the heart rate up. 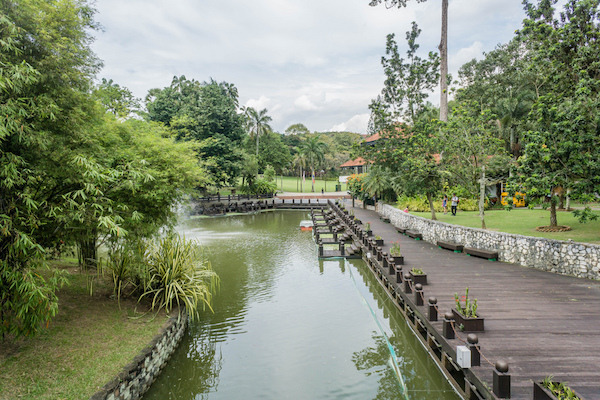 A good starting point or meeting point is the Laman Perdana, a square near the boathouse that’s a designed gathering spot. NOTE: Open 7am-8pm. Add-On: Jump across Jalan Parlimen and run another 1 km or so along the paths of the Asean Sculpture Garden and the Tugu Negara monument, honoring those who died in the 1945 Battle of Surabaya against the British. You can also run on the road approaching the Malaysian Houses of Parliament just to the west, but note it’s a wide, busy road (with sidewalk).